Red Cross volunteers from Iowa are helping with sandbagging in Fargo, North Dakota, as the Red River rises well beyond its banks. The record crest is expected on Friday or Saturday, perhaps 23 feet over flood stage. Maryann Sinkler, from the Central Iowa chapter of the Red Cross, says sandbags are being filled at a furious pace. Sinkler says when she arrived on Sunday, there was a place called Sandbag Central, while there were several spots along the river where sand was just dumped and volunteers were pitching in to fill bags. 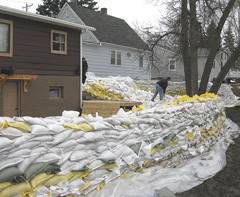 Up to 400,000 sandbags are being made daily as hundreds of volunteers try to build up Fargo’s protective dike to hold off the expected record flood. She says Sandbag Central is buzzing with hundreds of volunteers from the National Guard and elsewhere. The FargoDome has also been opened up for sandbagging while North Dakota State University has canceled classes until further notice. Sinkler says thousands of college students are churning out the sandbags, as perhaps two-million sandbags will be needed. 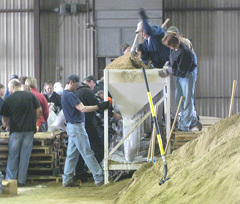 She says even though classes are canceled, the college students aren’t just taking off, they’re enthusiastically rallying each other through the tedious and labor-intensive task of filling and stacking sandbags. Employers are also being urged to give workers time off so they can assist in the effort. Sinkler and other Red Cross workers are helping to provide food for the volunteers and they’re preparing to shelter anyone who’s displaced by the floods. Fargo got whalloped with 16-inches of snow one day late last week and huge mountains of snow are heaped around town, piles she says are easily six-feet high. A rapid melt-off would compound flooding troubles.